This is a long overdue post from my time spent in Cartagena, Colombia. My family has been in the process of relocating to different countries to choose our best fit. (Be sure to subscribe to follow our journey and find out where we have chosen as our new home!) Also, during this time, my husband lost his phone with all of our photos from the trip! SMH! Nonetheless, here it is! And I hope that you can gain some well-informed info from my experience. In 2016, my family of four took a vacation to Cartagena, Colombia. We were living in Medellin, which is known for having the spring-like climate. I also wanted to get a break as a mother and wife…A week where I could be lazy…no cooking and no cleaning!! Let me start by saying Cartagena is a beautiful place to visit. It is HOTTER THAN PROBABLY HELL ITSELF LOL. And, if you aren’t prepared to weather the extreme heat, you may or may not enjoy your time there. For our family, it was nothing that a hat, a towel, and some cool water couldn’t fix. When we got to the airport, the heat hit us instantly! It was no mistaking the difference between Medellin and Cartagena. We only had two suitcases. But, there was a long line outside of the airport filled with people waiting for taxis. With our two children, we didn’t want to risk them getting fussy. So, we opted for the other alternative. There were two men waving to get our attention, telling us they could take us to our hotel quicker. Because we were familiar with the Latin American culture, we weren’t afraid to accept the ride. From our experience, pirate taxis are supposed to be more affordable. It is comparable to a distant cousin or neighborhood handyman doing services for a cheaper rate instead of going through the hassle of paying overages for first class service. Most of you know what I mean by this LOL. But, this occasion was different because we actually ended up getting bamboozled out of 30,000 COP. If you have ever taken a taxi in Colombia, the rates are seriously inexpensive. You can catch a ride all the way across town for less than 30,000 COP (about 10 miles or so). Our hotel was LITERALLY .8 miles up the street from Rafael Núñez International Airport, a five minute drive. We were charged 30,000 because of the size of the vehicle. Remember, we only had TWO SUITCASES. But, because they transported us in a van, they could charge that much according to their regulations. Had we taken a regular taxi, the most would have been about 10,000 COP. Still more than Medellin, but reasonable considering this was a touristy location. I also realized that, from our trips, none of the taxis had meters (*As of 2016). So, if you weren’t familiar with Colombian Pesos, you could easily be scammed if a taxi driver was dishonest. Just to note, our hotel, GHL Corales de Indias, had their own taxis. From our experience they are very clean, air conditioned, comfortable, and overall felt safe. They were very honest with their prices and gave us helpful tips about the area. So, we get to GHL Corales de Indias, where we stayed for the whole week’s vacation. The concierge opened the door of the taxi for us. He carried our luggage up a flight of stairs, and showed us where to check in. It was hot, and the children were restless, but the staff made it super easy to get checked into our room. Everything appeared clean. They had an employee cleaning the pool area all throughout the day…sweeping water away from the walk areas to prevent falls. The environment was very family friendly. There is a playground area at the hotel that is enclosed, private and with enough play equipment for small children. The pool’s water was at a decent temperature to cool you off in the hot temperature. We get to our room…it was a room that had the ocean view and balcony…it was clean. No musky smells. Because of the tropical climate, mold is not uncommon in hotel rooms or homes. From my recollection, we did not have this problem. We didn’t know beforehand, but we found out the hotel had 24 hour room service!! We took advantage of that as soon as we could. Because we booked directly from the hotel’s website, we received a free night tour of the town, 30% off each night, and 2 free mojitos through their bar, Alcatraz. However, we arrived on Sunday. We didn’t know the tours were only on Sunday night and Saturday night. We were too tired the first night to do the tour and we would be flying out on a Friday. So we didn’t get a chance to enjoy this. As a disclaimer, the hotel did have this information documented in our reservations, we just didn’t read!!! So don’t be like us and miss out on a free tour. We actually ended up paying for a tour through a company that was sponsored by the hotel. It was really nice!!! The tour guide was knowledgeable of the area. He spoke Spanish and English to the best of his ability. Each attraction required an additional entrance fee. So, for example, a part of the tour was a trip to see the Monastery, the chapel located on top of Mount Popa. The entry fee was about 10,000 COP each. No fee for children 2 and under. Cool. We were thinking, okay. This is just a small fee to help, no big deal. But when we got to each site, there were more entrance fees. I can’t remember the exact price for the entrance fee to the castle, also known as Castillo San Felipe de Barajas, but I do remember that no one on the tour was interested after hearing the price. The last stop was a tour of the city. Nice little evening tour to end the night before heading back to our hotel. HOWEVER……Afterwards, we had to pay for our own taxi back to the hotel!! To be honest, this tour was very long. I would not advise young children to be taken along on tours like this. Our kids were sleep most of the duration of the trip. And, we wouldn’t have been able to tour the castle having to walk up stairs for long periods. The heat combined with riding on the trolley made them tired! Also, if you plan to take any tour while in Cartagena it would be best to bring walking shoes, bottled water, additional shades, and a hat during day tours. As stated earlier, the hotel has its own pool. It has one adult pool, jacuzzis, an area for the kids to play and get wet, but not deep enough to swim, per se. Very safe. And then another shallow area to keep cool without having to submerge your whole body in water. We wanted to see how the beaches were. The hotel’s taxi driver advised us of Playa de las Americanas. BIG MISTAKE! If you’re looking for white sand beaches, this will NOT be the place. The beach’s sand felt more like mud due to the saturation of the water. It also had trash along the shoreline, which appeared to be coming from the ocean. The water looked very murky. The worst part of our experience here were the women bombarding us with un-welcomed massages. Don’t get me wrong, I completely innerstand that some of the people of Cartagena survive by receiving money from tourists..any means necessary. I have to be humble for a moment and place myself in their shoes. This is how they eat and maintain a living. However, during a time when you are going to a place to simply relax, it can be frustrating. We said NO or NO QUIERO..NO NECESITO….and that didn’t even help. The women continued to massage and wash our feet without our permission. And still expected 10,000 COP each for the 3 minutes they massaged us unwelcomely. They even massaged our four year old daughter’s feet…same price. Being here at the beach reminded me of our trip to Jamaica..feeling pressured to give money. It was overwhelming not being able to relax for the first two hours! This and being tricked out of 30,000 COP for a taxi were the only down points to the whole trip. But, I can’t end on a negative note. Here are some positives to the trip and some things to remember to be respectful to the culture. Pictured below is a beautiful fruit basket lady, known as Las Palenqueras. As a tourist, I thought it would be cool to take a picture from our trolley so that I could share it with family back home. As I began to do this, the lady quickly covered her face. I thought, “This is odd.” But after the trip, I began to do some research, and I realized that it is actually very rude to take a picture without asking first and giving them compensation for their time. This was an ignorant mistake that I had made. And I’m sure there are more innocent tourists who do it without thinking that there’s anything wrong with the idea. 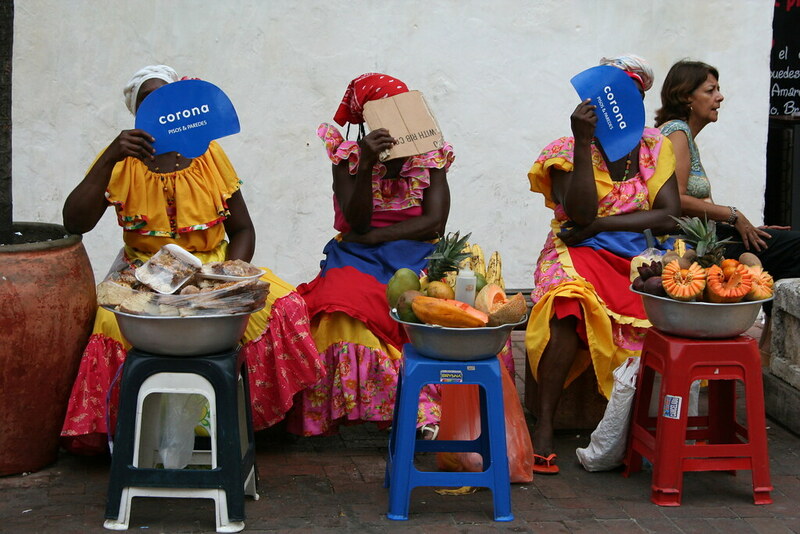 These women work all day long underneath layers of clothing in the heat of Cartagena. This is their livelihood. This is their survival income. In fact, the minimum wage in Colombia as of 2016 is equivalent to 689,455 COP or $234 USD monthly. So, as a reminder to you if you do plan to visit Cartagena, please keep this in mind. Imagine yourself in their shoes. A few dollars for a picture will not hurt your pockets, in exchange for their time, just to say thank you. Another positive note, Corales de Indias had a delicious breakfast buffet! You have to catch the breakfast at the right time for it to still be warm. So, going early before the crowd will be the best option. But, we could not beat the service we received from the hotel during the week. It was above what we expected. I give them a 4.8/5. Click here for a link to their website if you want to explore. Overall, if I could go back to Cartagena de Indias, I would do so with a better sense of how to navigate through the tourist traps. I would also do thorough research BEFOREHAND for the best beaches to visit with young children. Cartagena, Colombia is a beautiful place to visit. And I can’t forget about the beautiful brown melanated beings that reside there! Let me close this up before I go into ANOTHER dialogue of how attractive the men are LOL. LET ME JUST SIMPLY SAY, if you have an open mind and are excited about visiting Cartagena to get a feel for another culture, please do so. After reading this, I hope you will be able to have a wonderful experience in Cartagena, Colombia. Previous Where does my writing come from?